Orange county 1980 used to be open lands, just the beginnings of planned housing and the suburbs there. I remember looking out from our backyard, we could see the ocean, the open bluffs (where the Ritz Carlton now stands), brown and empty hills all around. 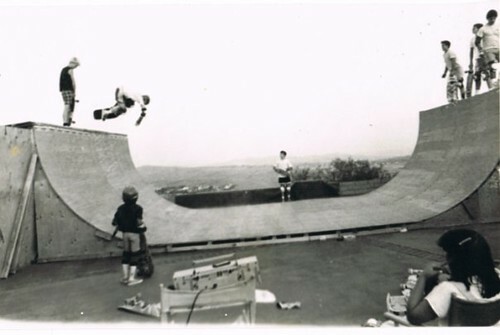 My brothers were skaters, hence I skated too (there I am, waiting on the bottom of the ramp for my turn). I learned to skate on this ramp in my backyard. It was once behind the Subaru Dealership. If I recall correctly, they cracked down and my brothers and his friends moved it and rebuilt in in our back yard. It was a staple for the entire community. I remember the day a young Tony Hawk came to skate. Seriously. We had tons of skaters and friends at our house every single day. My mom even set up a mini business through the window of the backyard selling burgers, hot dogs, and otter pops to all the kids. This photo is bringing me back to some good times.